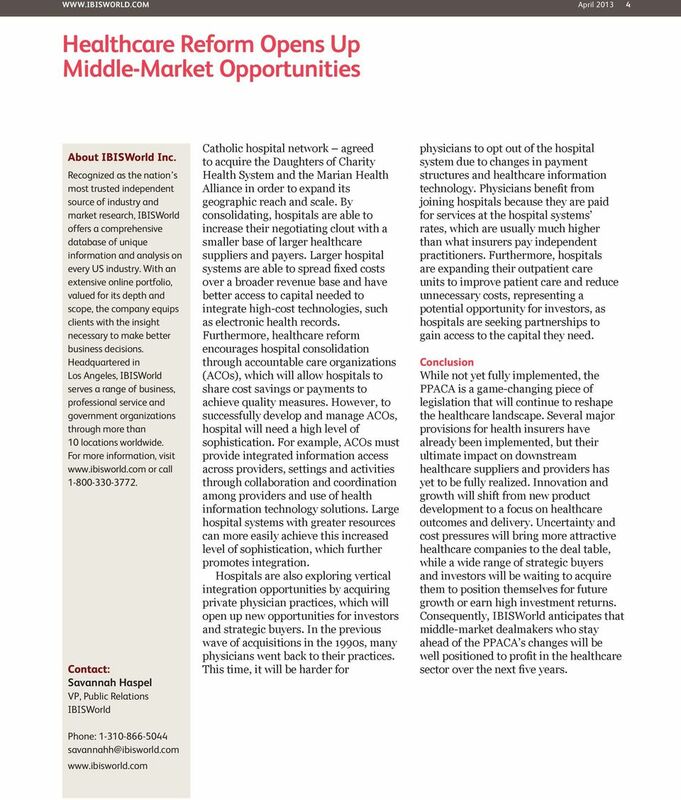 Download "Healthcare Reform Opens Up Middle-Market Opportunities"
4 April About IBISWorld Inc. 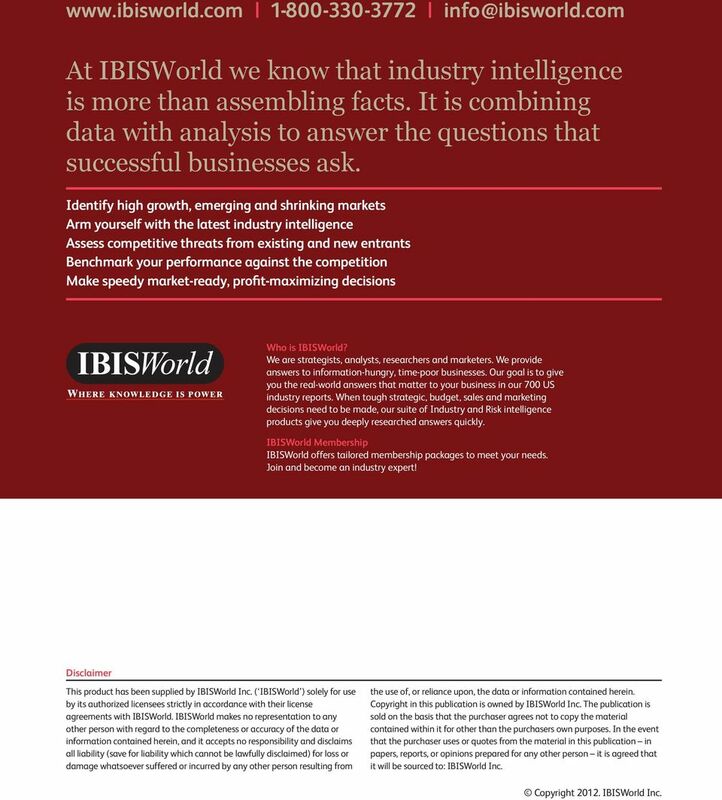 Recognized as the nation s most trusted independent source of industry and market research, IBISWorld offers a comprehensive database of unique information and analysis on every US industry. With an extensive online portfolio, valued for its depth and scope, the company equips clients with the insight necessary to make better business decisions. Headquartered in Los Angeles, IBISWorld serves a range of business, professional service and government organizations through more than 10 locations worldwide. For more information, visit or call Contact: Savannah Haspel VP, Public Relations IBISWorld Phone: Catholic hospital network agreed to acquire the Daughters of Charity Health System and the Marian Health Alliance in order to expand its geographic reach and scale. 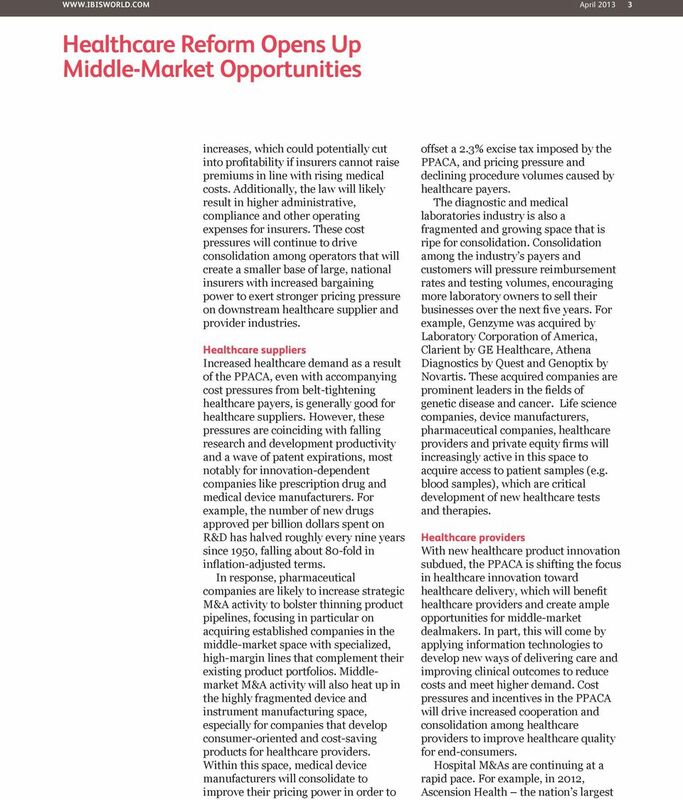 By consolidating, hospitals are able to increase their negotiating clout with a smaller base of larger healthcare suppliers and payers. Larger hospital systems are able to spread fixed costs over a broader revenue base and have better access to capital needed to integrate high-cost technologies, such as electronic health records. Furthermore, healthcare reform encourages hospital consolidation through accountable care organizations (ACOs), which will allow hospitals to share cost savings or payments to achieve quality measures. However, to successfully develop and manage ACOs, hospital will need a high level of sophistication. For example, ACOs must provide integrated information access across providers, settings and activities through collaboration and coordination among providers and use of health information technology solutions. Large hospital systems with greater resources can more easily achieve this increased level of sophistication, which further promotes integration. Hospitals are also exploring vertical integration opportunities by acquiring private physician practices, which will open up new opportunities for investors and strategic buyers. In the previous wave of acquisitions in the 1990s, many physicians went back to their practices. This time, it will be harder for physicians to opt out of the hospital system due to changes in payment structures and healthcare information technology. Physicians benefit from joining hospitals because they are paid for services at the hospital systems rates, which are usually much higher than what insurers pay independent practitioners. Furthermore, hospitals are expanding their outpatient care units to improve patient care and reduce unnecessary costs, representing a potential opportunity for investors, as hospitals are seeking partnerships to gain access to the capital they need. Conclusion While not yet fully implemented, the PPACA is a game-changing piece of legislation that will continue to reshape the healthcare landscape. Several major provisions for health insurers have already been implemented, but their ultimate impact on downstream healthcare suppliers and providers has yet to be fully realized. Innovation and growth will shift from new product development to a focus on healthcare outcomes and delivery. 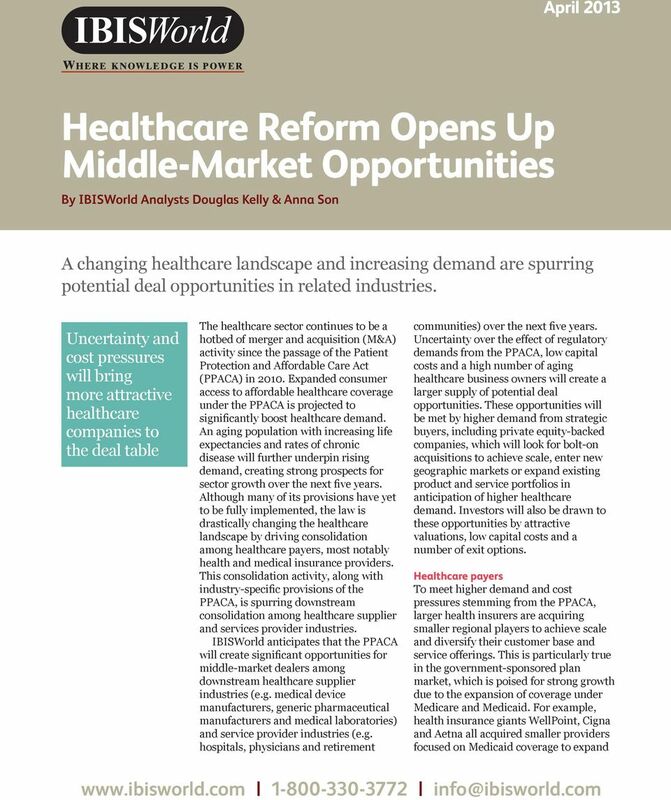 Uncertainty and cost pressures will bring more attractive healthcare companies to the deal table, while a wide range of strategic buyers and investors will be waiting to acquire them to position themselves for future growth or earn high investment returns. 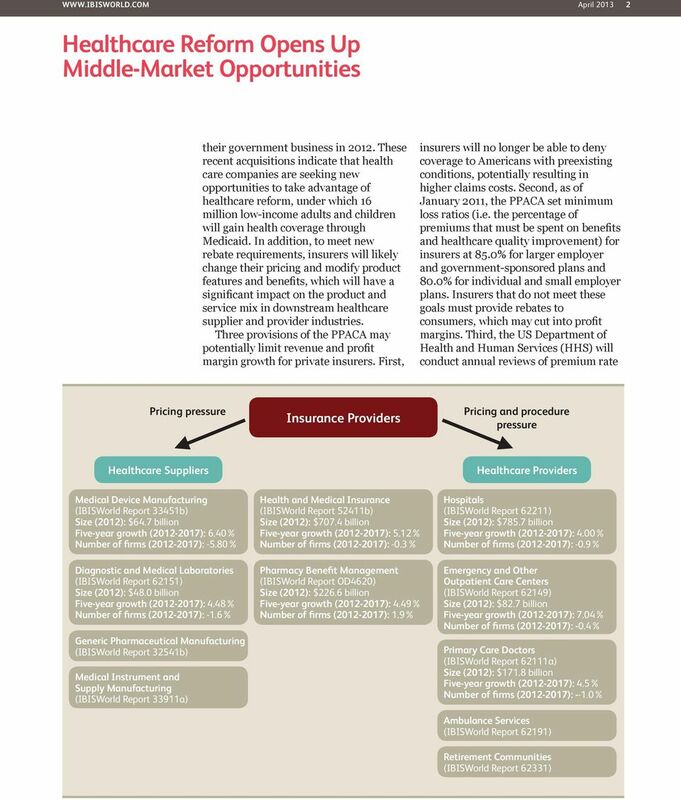 Consequently, IBISWorld anticipates that middle-market dealmakers who stay ahead of the PPACA s changes will be well positioned to profit in the healthcare sector over the next five years. and Results of Operations The following information should be read with Ascension Health Alliance s audited consolidated financial statements and related notes to the consolidated financial statements. Financial Services Practice. The Future of Group Life Insurance in the U.S.